“Analysis of Algorithms” is concerned primarily with determining the memory (space) and time requirements (complexity) of an algorithm. The time complexity (or simply, complexity) of an algorithm is measured as a function of the problem size. Some examples are given below. The complexity of an algorithm to sort n elements may be given as a function of n.
The complexity of an algorithm to multiply an m*n matrix and an n*p matrix may be given as a function of m , n , and p.
All are important but we will mostly talk about time complexity (CPU usage). Identify the most important operation of the algorithm, called the basic operation , the operation contributing the most to the total running time, and compute the number of times the basic operation is executed. one arithmetic operation (e.g., +, *). there are many algorithms for which running time depends not only on an input size but also on the specifics of a particular input. The worst-case complexity of the algorithm is the function defined by the maximum number of steps taken in any instance of size n. This represents the curve passing through the highest point in each column. The best-case complexity of the algorithm is the function defined by the minimum number of steps taken in any instance of size n. This represents the curve passing through the lowest point of each column. 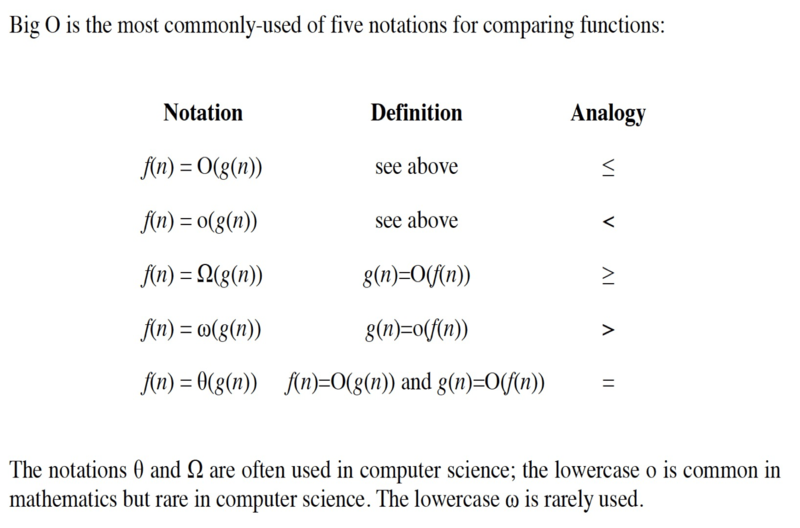 The average-case complexity of the algorithm, with is the function defined by the average number of steps over all instances of size n.
Consider, as an example, sequential search. Clearly, the worst-case analysis provides very important information about an algorithm’s efficiency by bounding its running time from above. The important thing to realize is that each of these time complexities define a numerical function, representing time versus problem size. 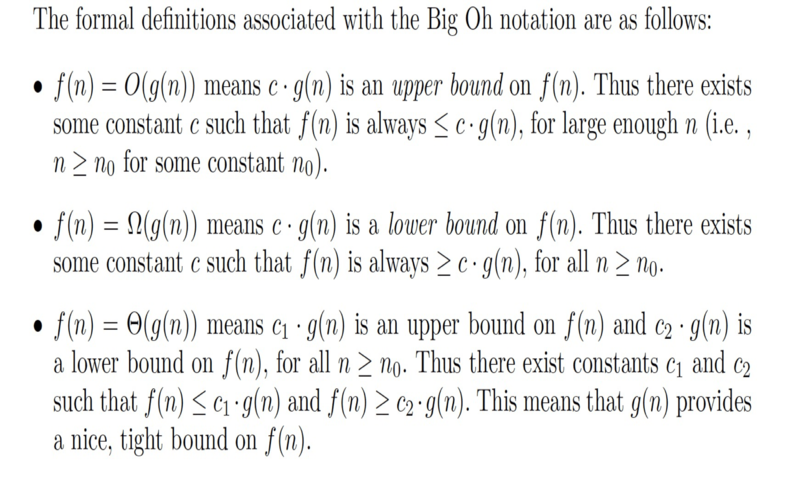 Time complexities are complicated functions and we need to simplify that to work with them For this, we need the “Big Oh” notation. when analyzing some algorithm, one might find that the time (or the number of steps)it takes to complete a problem of size n is given by T(n)=4n2 -2n+2. If we ignore constants (which makes sense because those depend on the particular hardware the program is run on) and slower growing terms, we could say “T(n) grows at the order of n ” and write: T(n) = O(n2). It proves to be much easier to talk in terms of simple upper and lower bounds of time-complexity functions using the Big Oh notation. The Big Oh simplifies our analysis by ignoring levels of detail that do not impact our comparison of algorithms. 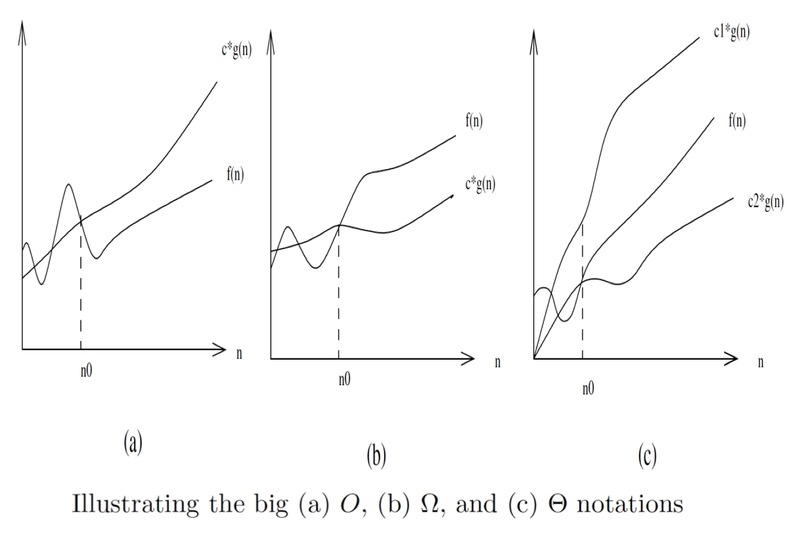 The Big Oh notation ignores the difference between multiplicative constants. 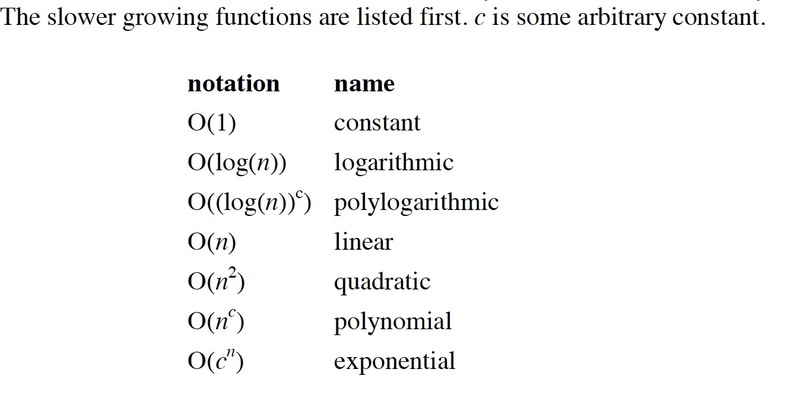 The functions f(n) = 2n and g(n) = n are identical in Big Oh analysis. Copyright © 2014 BasicsBehind.com®. Some rights reserved. BasicsBehind.com writings are licensed under a Creative Commons Attribution 4.0 International License.